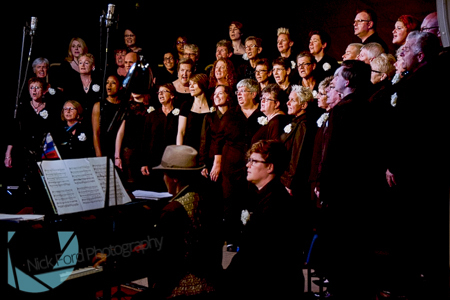 An evening out with the Rainbow Chorus is more than just going to a concert, it’s an expression of belonging, solidarity and inclusion that defines the very notion of community that many aspire to when they come to live in Brighton and Hove. 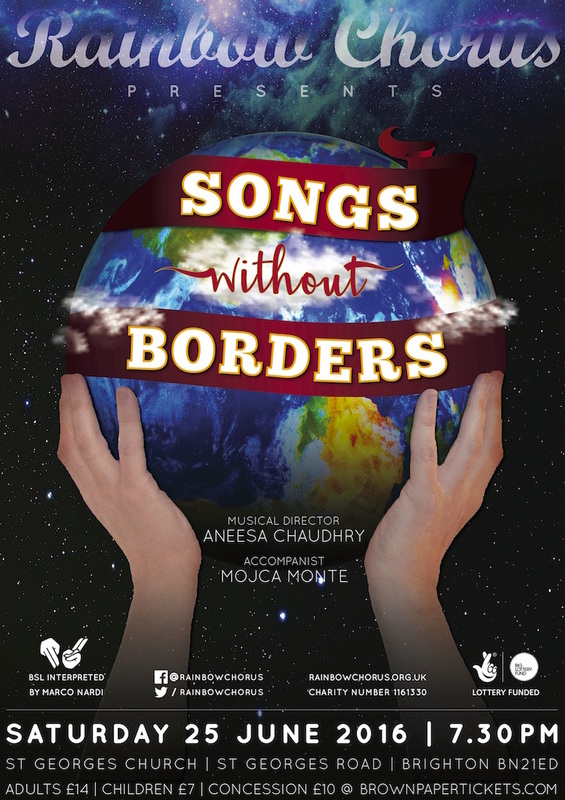 Songs Without Borders, gives Brighton’s only LGBT choir the opportunity to show the improvement they have made in the last year….and they certainly have made major improvements in all areas of performance and production. The sound they produce has come on leaps and bounds and while they are still short on numbers in the bass section the choral sound they make when they open up is glorious. As a singing unit they have gained so much confidence in the last two years, performing with a new-found assurance and attack. Musical director Aneesa Chaudhry ably assisted by accompanist Mojca Monte have created a well-drilled unit and this is especially noticeable in the improvement of the confident sound made by the tenor section where the mixture of male and female voices helps create the Rainbow sound. While some of the items on the programme were old favourites I had heard before, they sounded fresh and current, especially the uplifting rendition of Cold Play’s Viva La Vida, my personal highlight of the evening. Carly Simon’sLet The River Run was sung with conviction and sent shivers up this old mans spine. Tom Springfield’sThe Olive Tree which opened the second half of the concert, was pure and simple in delivery while the performance of Time To Say Goodbye perfectly captured the spirit of the second half of the concert which was to remember Labour politician Jo Cox. The secret of good program planning is making sure there is something for everyone to appreciate and enjoy. Performed against the backdrop of the Orlando massacres, the murder of Jo Cox MP and the growing plight of refugees and asylum seekers, Songs Without Borders ticked all the boxes and set the tone of the evening to perfection. Rainbow Chorus chose to raise money for the Brighton based charity Brighton Voices in Exilewith a raffle and bucket collection. The charity reaches out to those seeking asylum, refugees and those with no recourse to public funds within Sussex. Your next opportunity to hear the Rainbow Chorus in concert will be at their Winter Warmer Show on Saturday, December 10.